This assembly program shows the range of Hughes’ styles and themes through poetry, song, and movement. The students will perform the poems, helping the students discover their own dreams, how those dreams can be deferred and how, ultimately, they can be fulfilled. The principal texts are from “The Dream Keeper” and other poems, illustrated by Brian Pickney. Additional texts include poems by Gwendolyn Brooks, Sam Allen, and Eloise Greenfield, as well as song lyrics by Sam Cook and Curtis Mayfield. 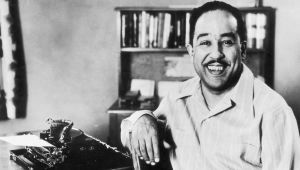 A writing workshop includes two to three writing prompts based upon Langston’s poems “Dream,” “Poem,” and “Motto.” The workshop can be offered as a stand-alone workshop, or a post-assembly workshop.